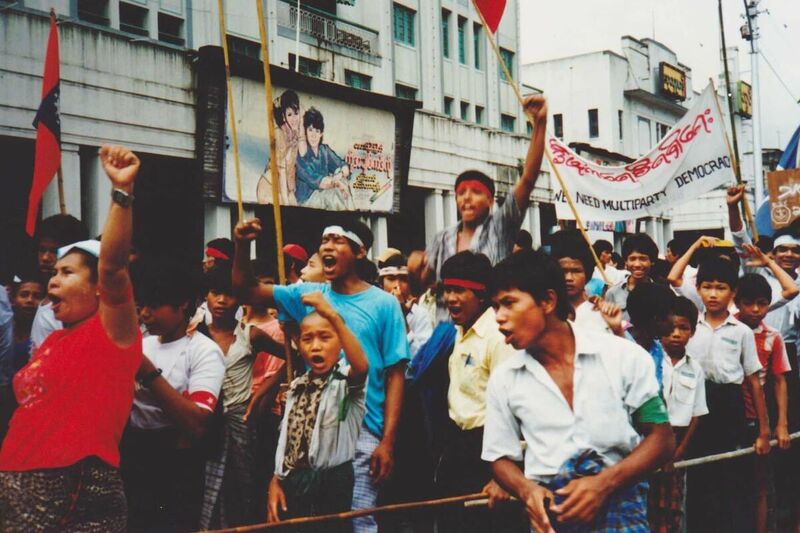 Timeline: Myanmar's '8/8/88' Uprising The country also known as Burma was rocked by mass protests in the summer of 1988. Discontent through the spring led to a general strike on Aug. 8, but the demonstrations and upheaval in the following weeks were capped by a brutal September crackdown. Demonstrators march on a street in downtown Rangoon in August 1988. Students, civil servants, monks and others joined the protests that summer. Here are some of the major events surrounding the protests in Myanmar, also known as Burma, in the summer of 1988. A general strike on Aug. 8 of that year prompted weeks of protests, which ended with a brutal crackdown the following month. The government declares several currency denominations worthless, wiping out the savings of many Burmese. A brief student uprising in response foreshadows the widespread unrest that would break out the following year. A fight between students and locals tied to the military breaks out at a tea shop, leading to protests the following day. One student is killed. Several days of demonstrations crest as riot police attack a column of students near the White Bridge on the banks of Inya Lake in Rangoon. Dozens die and hundreds are arrested and imprisoned in the event, which came to be known as "Red Bridge." The government closes all schools and universities. Ten more days of protests break out after schools are reopened. Student leaders like Min Ko Naing and Moethee Zun begin to emerge. More demonstrations are held and more crackdowns take place. Ne Win, who had taken over state power in a 1962 coup, resigns as head of the Burma Socialist Program Party, officially giving up state power — although many believe he continued to rule from behind the scenes for many years. In his resignation, Ne Win promises a move toward multiparty democracy, but also issues a threat to demonstrators: If the army shoots, it hits; it does not aim into the air. Sein Lwin, a man held responsible for much of the violence against demonstrators early in the year and for other acts of brutality, is named Ne Win's successor. Widespread outrage at this appointment provides more momentum toward a massive general strike. BBC Burmese broadcasts student leader Htay Kywe's announcement of a general strike to take place in two days. Hundreds of thousands of people join massive, countrywide general strikes. Momentum continues to build in the ensuing weeks. Sein Lwin resigns after 14 days as the country's leader. Dr. Maung Maung, a civilian intellectual closely aligned with the military government, is made president. Aung San Suu Kyi makes her first public speech during a rally at Rangoon General Hospital. Suu Kyi gives her first major speech in front of an estimated 500,000 people at Rangoon's iconic Shwedagon Pagoda. Demonstrations continue to grow across Burma. In Rangoon, much of the municipal government collapses and local administration is taken over by the people. Violence from both sides escalates. A new leader, Saw Maung, and a new government, the State Law and Order Restoration Committee (SLORC), is announced. This "coup" is, in essence, a return to the martial rule of the previous 25 years. Crackdowns begin across the country the following day. Intelligence forces begin rounding up hundreds of demonstrators, including many leaders. Thousands flee to the border, many into exile and others to the Thai and Chinese borders, where they join ethnic armies locked in long-running battles with the Burmese army. SLORC issues a law allowing political parties to register. Five days later, the National League for Democracy (NLD), with Aung San Suu Kyi as its general secretary, is formed. Suu Kyi and others begin campaigning in Rangoon and across Burma. Suu Kyi is placed under house arrest, where she would remain off and on for most of the next 20 years. Many other NLD members are rounded up. SLORC sets an election for May 1990. Nationwide elections are held and are considered relatively free and fair. Suu Kyi's NLD party wins a resounding victory, taking 60 percent of the popular vote and 80 percent of parliamentary seats. SLORC ignores the election results and remains in power, under different names, for the next two decades.